I had a comp day to use today and wanted to go ride. 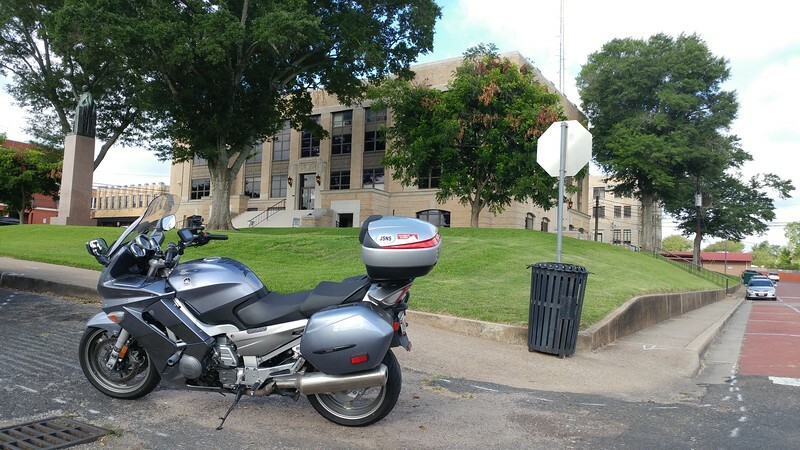 I missed using any of my comp days in the spring for riding due to all the stuff going on at my kid's school, but it was good to have those days off. But today was for me. 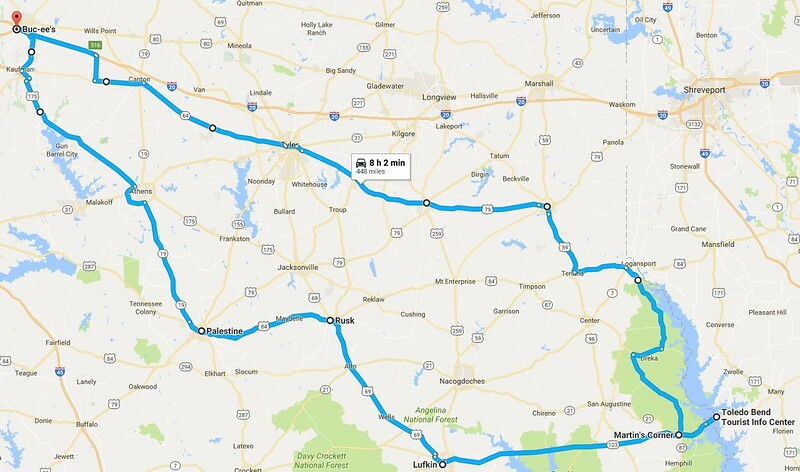 I wanted to hit the Piney Woods again, but this time further south. I have some future plans to get the dates all worked out and this was time for some scouting and testing. I'd heard of a good place to eat out there and figured I'd hit it up and scoop up a few more county courthouses. 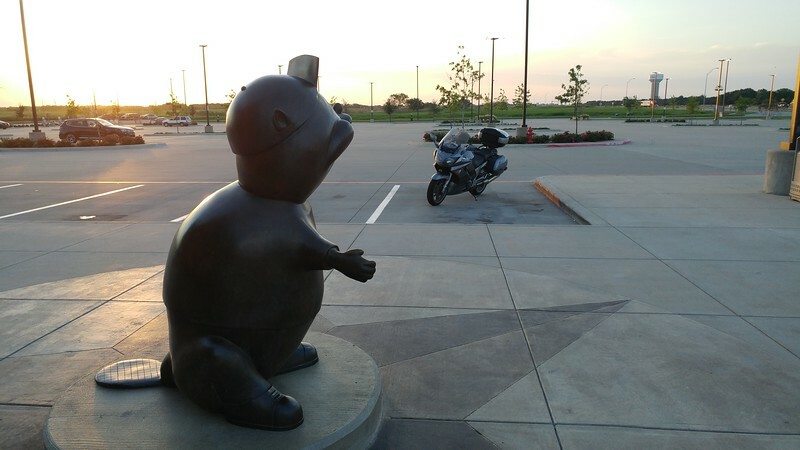 All trips east start and end at Buc-ees. I've talked about this place before so not much to be said. For those in Florida, you are in for a treat as they are opening their first non-Texas location in Daytona soon. Anyway, gas for the bike and the rider. 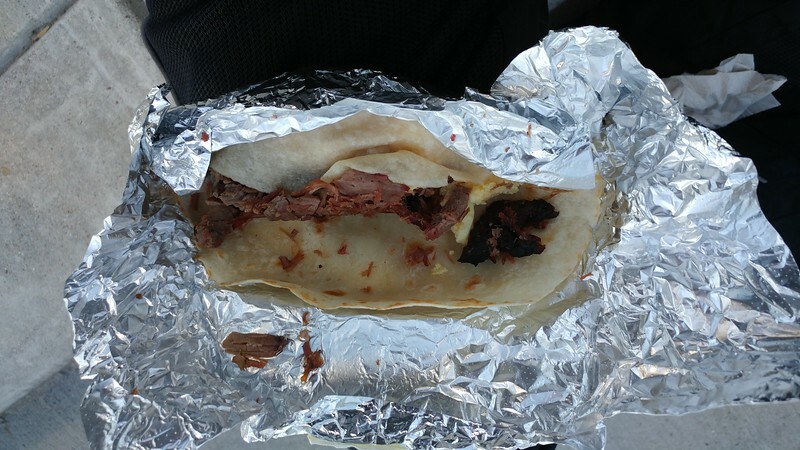 This was a brisket and egg burrito. I also got "The Hippo" breakfast burrito but did not take a picture of it though I should have. The Hippo comes with Eggs, bacon, beans, potato, cheese and green sauce. It was delicious. Nothing like sitting on a curb watching the sun come up while eating breakfast burritos and getting your coffee fix. 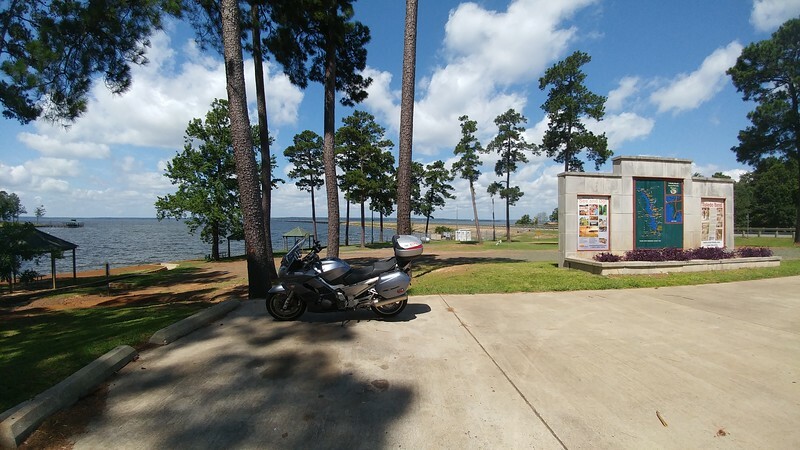 Then I was off on a mostly meandering route around East Texas and into the Piney Woods region. Grabbed two courthouses on the way. 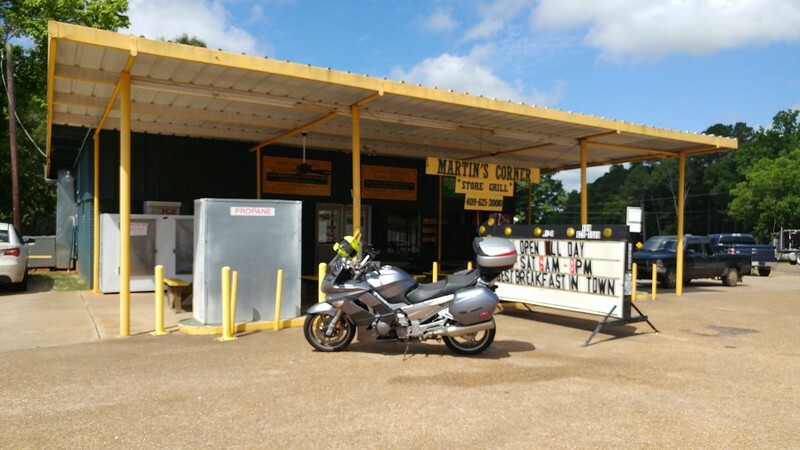 I arrived at Martin's Corner a little early, but they were still very nice and I got my lunch. Someone recommended this place recently somewhere, can't quite remember where though. But it was good. Not sure what my phone was focusing on but it's a little blurry which I couldn't make out on the phone. They had the "Martin Burger" and I figure if a place has a signature dish with their name on it I should try it. 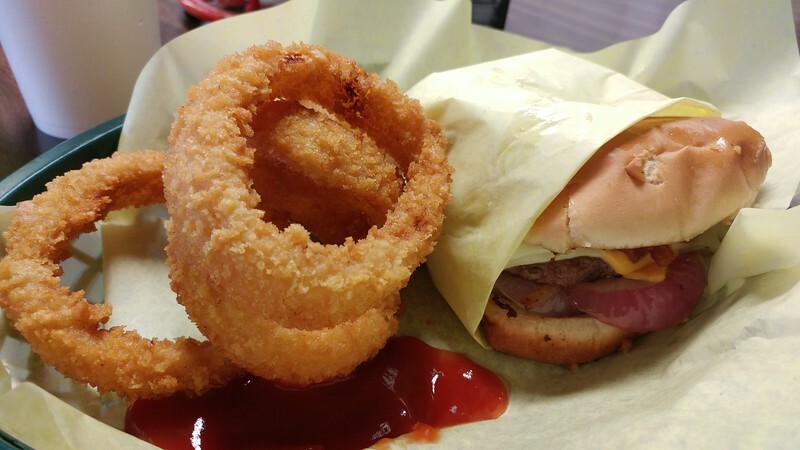 It comes with 3 cheeses, grilled onions, grilled mushrooms, peppers, bacon, BBQ sauce and topped with an Onion Ring. I skipped the mushrooms and had a side of crispy onion rings to go with it. It was delicious but I couldn't finish it. Well, technically I could have, but I'm trying to stop doing that, especially when on a motorcycle ride. While sitting in the restaurant I had a revelation. 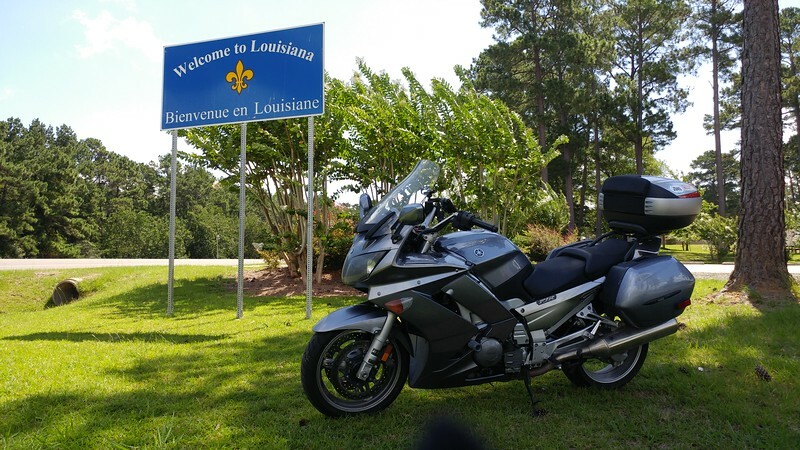 My FJR has never been to Louisiana. 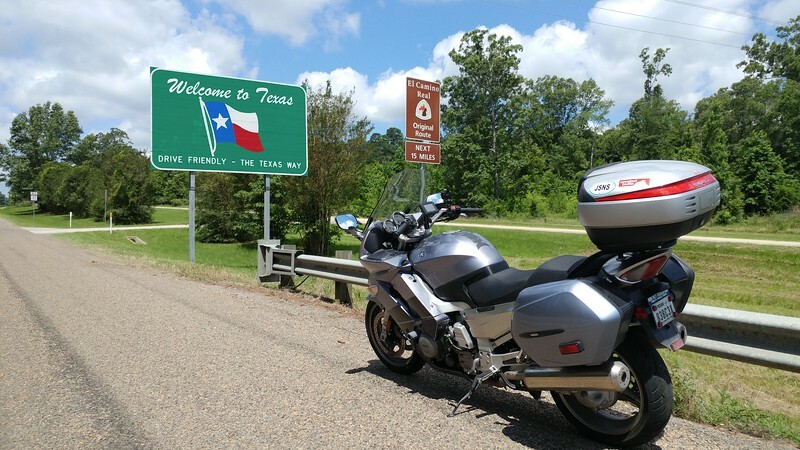 My trips east have gone out through Arkansas and I've been to Louisiana on other bikes but never on the FJR. 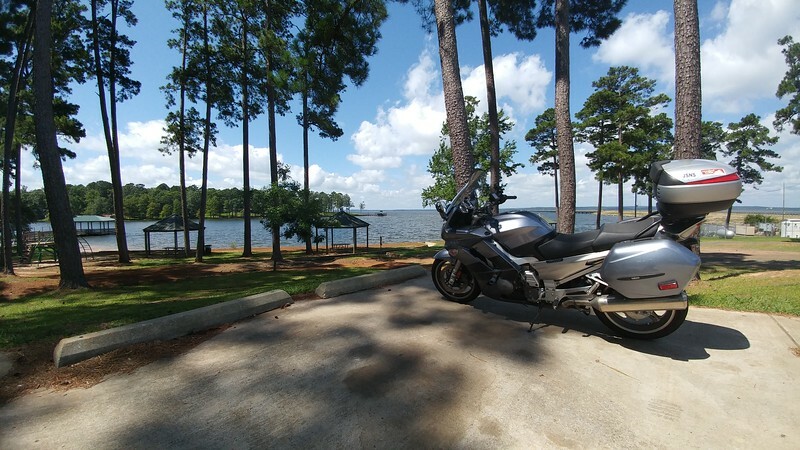 Well, I happen to be sitting an easy 7 miles from the border and there's a lake with a bridge that needs to be ridden over, so I did. I had to take this picture coming back into the great country of Texas. 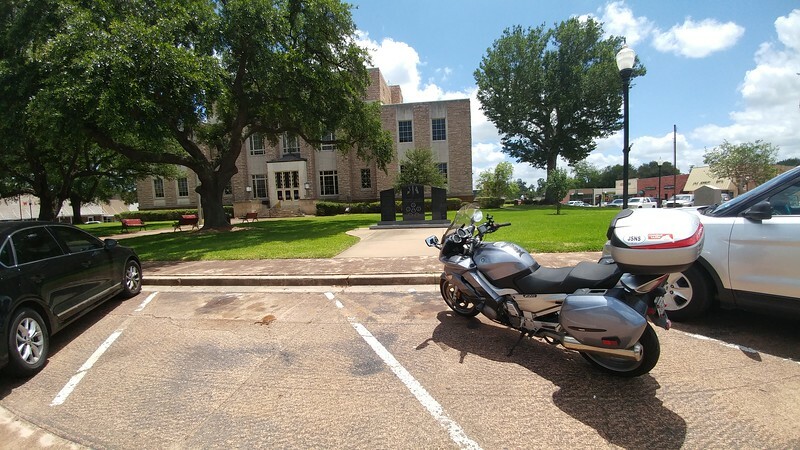 I already have a Texas sign with the FJR, but the El Camino Real was the theme of a rally that took place in April that I missed due to my shock going out. Was supposed to have been my first rally but didn't happen, so I wanted this picture. Bonus is that the Texas sign is there too. Heading back the way I came, shortly after passing Martin's Corner again I came to a stoppage of traffic. Looks like only one side at a time getting through, gotta be construction or something. Finally we get to move forward and I realize the flagger isn't wearing a construction uniform, but a fireman (fireperson) uniform. As we crest the hill I can see the fire trucks and wreckers. Clearly they are in cleanup mode because the wreckers are in use and there's no ambulances. I approach the first wrecker and it's got the most beat up semi truck I've ever seen. No front end damage but the drivers side is completely trashed for the entire length. It looks like someone parked it at the bottom of a mountain and then triggered an avalanche. It's so bad they didn't even bother with a normal semi truck tow truck it's up on a giant flatbed with straps over the top of it. The second vehicle is another semi truck but it looks more like a train than a truck because all the front bodywork is missing from the cab forward. Near as I could tell it looks like someone crossed the centerline but not a head on impact, and this back country road has 75mph speed limits with a zillion trucks, mostly logging trucks, all over the place. Neither of these were logging trucks though. Looks like the truck going my direction got hit and went off the road, but there's a good dropoff there and he didn't want to go there so he steered back onto the road. You could see the tracks go off and right back on the road and torn up dirt. Looks like he overcorrected on the brakes though because there's tracks going back across the road to my left and off the other side which has a larger steeper dropoff into the trees. It was a gruesome sight for sure. I was both happy and disappointed I wasn't running my gopro. 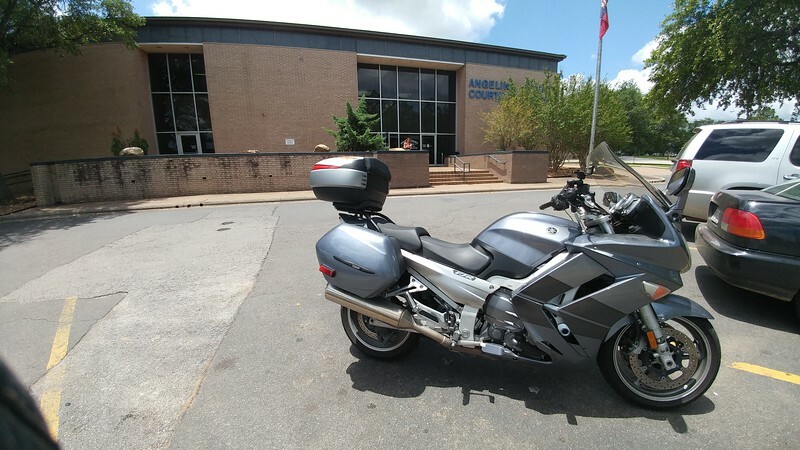 After that it was a matter of scooping up some more county courthouses. I learned today that Texas has both a town of Rusk and a Rusk county. 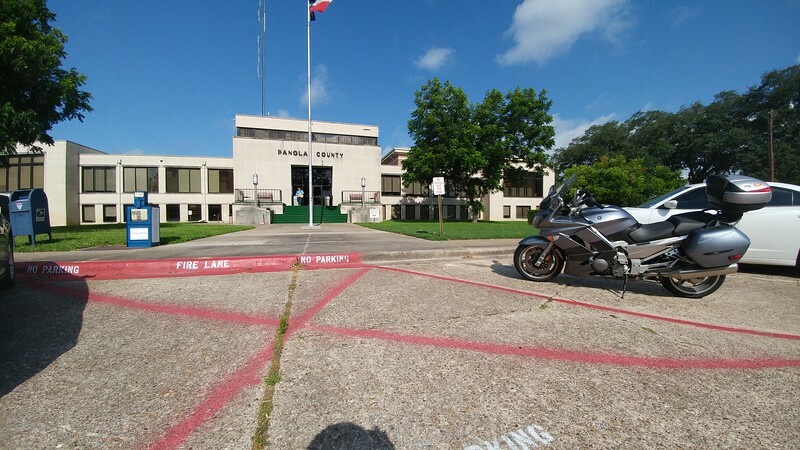 The county seat for Rusk county is not in the town of Rusk. It is in the town of Henderson. But the town of Rusk is a county seat, but not in the county of Rusk, it is in Cherokee county. My mapping and planning were hampered by this confusion. 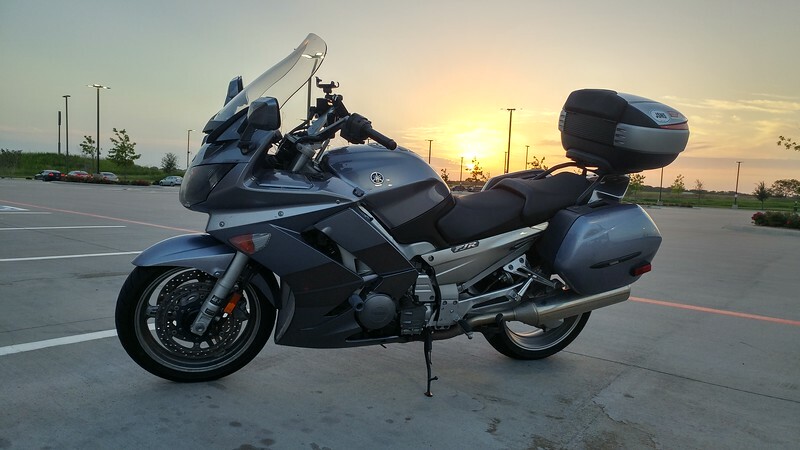 That said, the road between Rusk (the town) and Palestine (also a town) is pretty a pretty sweet FJR road. Speed limits were high enough to make the sweepers enjoyable and new pavement was a nice touch. After that, back to Bucees and then home. 486 miles for the day, not too bad. Got up to 97F today so not much more of this till at least mid September. I had a few more miles than the map shows due to taking off down a few roads here and there to see where they go as well as missing my turn in Tyler and riding all over the place to get back on course.